This class picks up where Level 4 left off. We will begin by learning a lot more about query criteria. We will learn how to use multiple AND / OR conditions in the same query. We will learn about the IN keyword to show records in a specified list of values. We'll learn about the BETWEEN keyword to view records between two values. You will learn how to use the NOT keyword. We'll learn about the different kinds of inequalities that you can use in your query criteria. We'll learn about the Show Box which you can use to hide fields from the query output. This is handy if you need to hide sensitive data, like a credit limit, but still need to use that data for your criteria. You'll learn how to use date-based criteria with the Date() function to show, for example, all records in the past, or all records that are more than 30 days old. We'll learn how to deal with empty/blank values with the Is Null and Is Not Null keywords. We'll cover wildcard characters and the LIKE keyword. This will allow you to find things like "all ZIP codes starting with 142," or "all customers with last names starting in S." We'll also see how to use wildcards to find records from a specific month. Next we'll learn about Parameter Queries. These are extremely powerful. 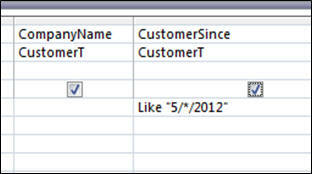 A parameter query allows the end-user to type in a value for a query criteria when the query runs. 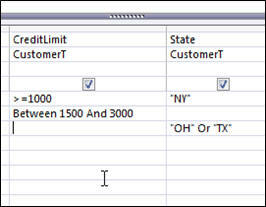 This way if you want to run reports for each state, for example, you don't have to make 50 different queries. The user can just specify "NY" or whatever state they want when the query runs. Finally, in our Questions from Students lesson, we'll cover several different topics, like how to show the Top 10 Values (or Top X values, or Top X percent) in a query, what the drop-down box for the field name in a query is for, why there is a RUN button for queries (instead of just the datasheet view button), and how to format the ouput of query fields. 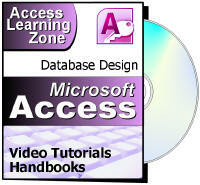 This is a great class for anyone who is wants to learn how to work with queries in Microsoft Access. Of course, if you have any questions about whether or not this class is for you, please contact me. "NY" OR "PA" OR "TX"
NOT "NY" AND NOT "OH"
Prevent odd names like "Field1"
Like "*" & [Company Name] & "*"